For over a week I have been chasing butterflies. This gets irritating to my family as it puts me behind. Actually, the longest wait they had was when I missed a way marker completely because I was working on making a lizard noose out of a piece of grass, but more on that another time . . . I’m getting a reputation for not paying attention, and I will take that to heart. Still, we have been seeing these beautiful chartreuse blended through bright yellow to orange butterflies for about a week. I have been following them, wanting them to land so that I could perhaps get a picture of one. But unlike other butterflies I have followed, these never, ever seemed to land on anything. They would pause with their beautiful wings open for a moment and settle slowly like most butterflies do when they land but then off they would go. I practically gave up, but they were so attractive to me I just couldn’t stop following them around. 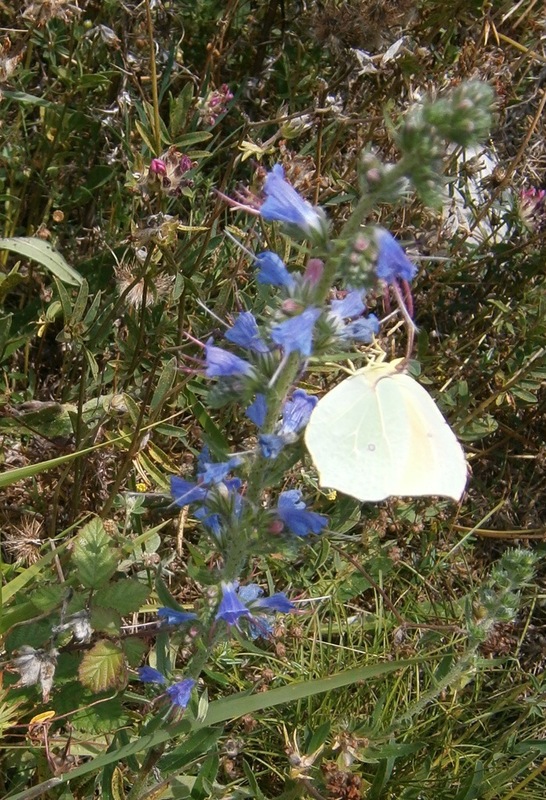 Then, yesterday, I noticed a whitish yellow butterfly on some blue flowers that I hadn’t seen before, it looked like a member of the borage family. 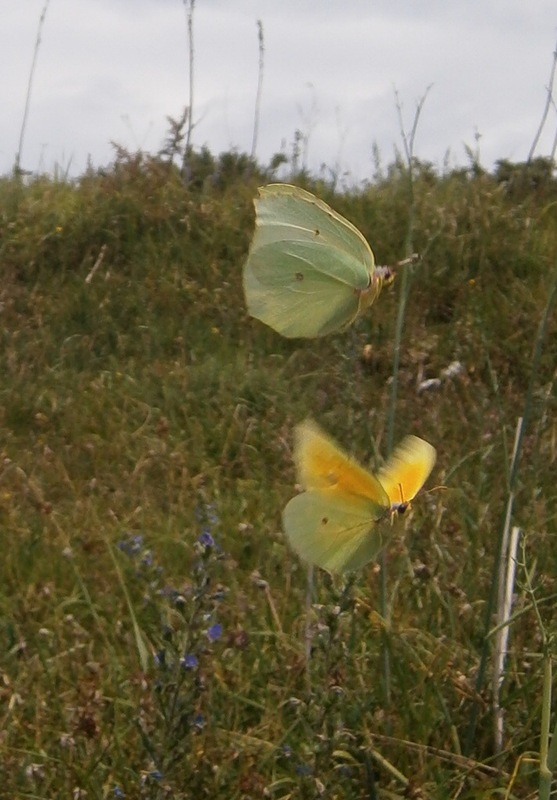 I went to take a closer look and it flew off, fluttering its pale yellow wings, and landed on another flower. “Well,” I thought, “It’s not one of those amazing orange butterflies but at least I can maybe get its picture.” I got out my little pocket snapshot camera and started the chase, clicking away, hoping for something to turn out. All of a sudden, one of the orange beauties appeared for a dance with my white friend . . . .
Making friends with other species ends up with remarkable rewards. If you had asked me if I thought it was possible to catch two butterflies in flight with my little pocket camera last week I would have said, “No.” But when one follows curiosity with childlike intensity amazing connections unfold. I find this is true whenever I let myself go free to love nature in a childlike way. I’m always grateful to be reminded of this. I highly recommend the book, by the way. It is available on Amazon and if you get the Kindle edition there are recordings to listen to in the text, which is really fun.